YANGON — With a pair of two-inch foldable scissors that she borrowed from a girl beside her, Shin Daewe quickly and discretely cut off her long curly hair so that other people in the vehicle would not notice her doing it. She was in an army truck with dozens of other people arrested by the Myanmar military. “I thought security officers wouldn’t recognize me so easily if I cut my hair short” former journalist Shin Daewe said, as she recounted the day she got arrested after documenting demonstrations in downtown Yangon known as the Saffron Revolution. She was working as an underground video journalist for exiled broadcast media the Democratic Voice of Burma (DVB) when the demonstrations that shook the entire country ten years ago took place. “I had reported what I saw on the streets to my editor through a mobile phone, with my long hair worn loose.” The slim woman in her mid-forties told The Irrawaddy that she decided to chop her long curly hair off since it was the most visible and recognizable aspect of her appearance. Shin Daewe also explained that anyone who held a camera could be targeted by authorities and those who covered protests, in particular, risked jail during military rule in Myanmar. She was not a stranger to demonstrations and detention. Shin Daewe was an activist involved in many protests following the military coup after the ‘88 democracy uprising. She was jailed for one month in 1990 and a year in 1991 for her involvement in demonstrations. Covering the Saffron Revolution was, however, not an easy decision for her, especially as she mostly covered social issues rather than news reports on politics or current affairs after joining DVB in 2005. She had been out of town for over 10 days doing a video feature and although she had heard radio reports of the protests, Shin Daewe was overwhelmed seeing all the demonstrations led by monks on streets across the city when she arrived in Yangon on Sept. 24. “It was shocking and hard for me to cope with what had happened to Yangon and its people,” she recalled. “At the same time, I felt very excited as well because I got to see such a revolution again in my life,” she said. Increasing fuel prices and the cost of basic commodities sparked the revolution. The 88 Generation student activists who were also prominent government dissidents led initial demonstrations in August. The crackdown on a peaceful demonstration in Sagaing Region’s Pakokku in early September resulted in three monks being injured and other monks holding government officials hostage and demanding an apology by Sept. 17. The military ignored the demand and disrobed some monks. From Sept. 22, demonstrations spread to major cities including Mandalay and Yangon, where thousands of monks and nuns gathered at the foot of the Shwedagon Pagoda and marched to City Hall. Shin Daewe started taking footage of the protests in the city on Sept. 25—a day after she got back to Yangon and when the military imposed a curfew for 60 days. “I told myself that I would film fast, run fast and go into hiding to avoid getting arrested,” Shin Daewe said. She failed to stick to her plan, however, as activism conflicted with professionalism. As an anti-government activist who committed herself to opposing the junta when she was in college as a teenager, she participated in many demonstrations protesting the government, which she described as very “satisfying” for her. “I felt happy and excited whenever there were protests,” she said. On Sept. 26, security forces dispersed the crowd of protesting monks and nuns with tear gas at the Shwedagon Pagoda. Thousands of people joined the crowd and the military’s crackdown began. In total, more than 50 monasteries across the nation were raided. On Sept. 27, she and her husband drove around the city to observe the situation. They rushed to Ngwe Kyar Yan monastery in northern Yangon when she heard security forces had raided and arrested several monks there the night before. “I did not dare enter the monastery. I was afraid that there could still be security officers inside the compound and I would get arrested if I entered, so we just drove passed the monastery,” she recalled. Hundreds of local people, including student protesters, filled the streets. It had been nearly two decades since she last saw demonstrations of this size in Yangon, she said. When she heard that there was a brutal crackdown near Sule Pagoda in downtown Yangon in which many people had been killed, she felt terrified and muddled. She first went back home to calm herself down. “After noon, I decided to go [and take videos]. I told my husband that it was for my own reputation and I must go,” she told The Irrawaddy, saying that she wanted to be responsible and have a clear conscience in her profession. Shin Daewe and her husband hired a driver to take them downtown. The pair agreed that both of them couldn’t get arrested and that one would try to escape whatever happened, she said. When Shin Daewe arrived downtown, she couldn’t get close to Sule Pagoda. Soldiers and policemen blocked the roads and fired into the crowds, sending hundreds of protesters running the opposite way. She saw bloodstains and shoes on the road. She later learned that by the time she arrived, the crowd in Sule had already been dispersed and Japanese photojournalist Kenji Nagai had been shot dead. She tried to film protesters on Bogyoke Road, but at the same time, she was concerned that they would not want her to film their faces. As she had protested on streets like them before, she was also worried about their security because the military could identify them from her footage. “Hiding myself behind a tall Indian man, I filmed through his underarm so that soldiers didn’t see me filming,” she described. She saw people throw rocks down onto army trucks driving along Bogyoke Road from Pansodan Bridge. She rushed to Tamwe Township as she heard there was another group of protesters there. She didn’t yet know that that was the day she had to throw away her own camera in exchange for possible imprisonment, as she had no official journalist identification, acting as an underground reporter for DVB. A few dozen protesters and some monks were trapped by soldiers in a street in Tamwe where Shin Daewe and her husband arrived. She asked her husband to remain in the car and rolled down into an open drain beside the street where many other people were already hiding. She held the camera up above the drain to record the scene, while other people in the drain scolded her for drawing attention to their hiding place. Even though she managed to film the incident while hiding in the drain, she never got to use the footage, as she got arrested along with many other people that day, including her husband who was hiding in the car. She managed to throw her camera away before her captors noticed. “I spent seven days in detention but didn’t get sentenced to jail time,” Shin Daewe said. “I told them, crying, that I was a housewife and just came to watch the protest,” she added, explaining that intelligence officers didn’t discover her activist background or previous imprisonments. Her husband, however, was detained for one month because, they assume, he was wearing a t-shirt depicting Argentina’s revolutionary leader Che Guevara. “They seemed really annoyed about the t-shirt, they asked him if he knew his revolutionary hero [Che Guevara] was a communist while we were demanding democracy,” she said of her husband’s imprisonment. Two months after the release of her husband, the couple decided to move to a different township in Yangon as they felt they were under scrutiny by authorities. According to state media, only about ten people died in the protests, but observers believe more than 100 were killed by military and police. 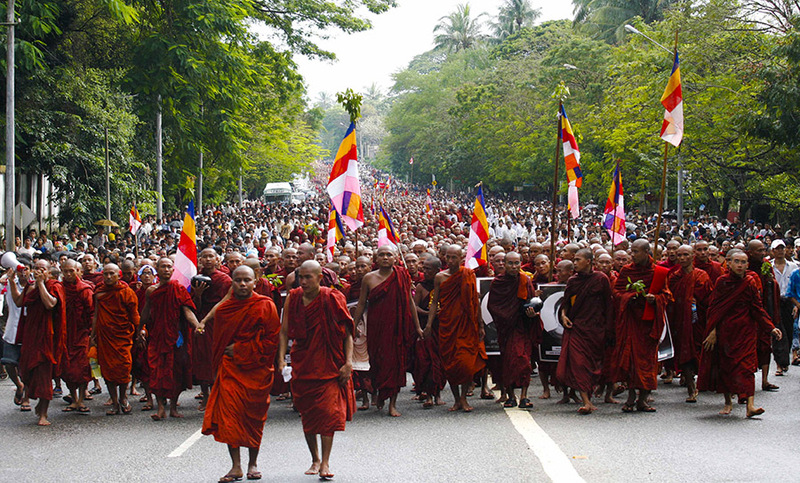 Thousands of protesters, including monks, were arrested. Saying she was “not a good journalist” covering the Saffron Revolution, Shin Daewe shared that she still feels irresponsible for not being able to get good footage of the historical demonstrations during the Saffron Revolution. With a dedication to expose the country’s political and social issues, Shin Daewe now continues her career as an award-winning documentary filmmaker. 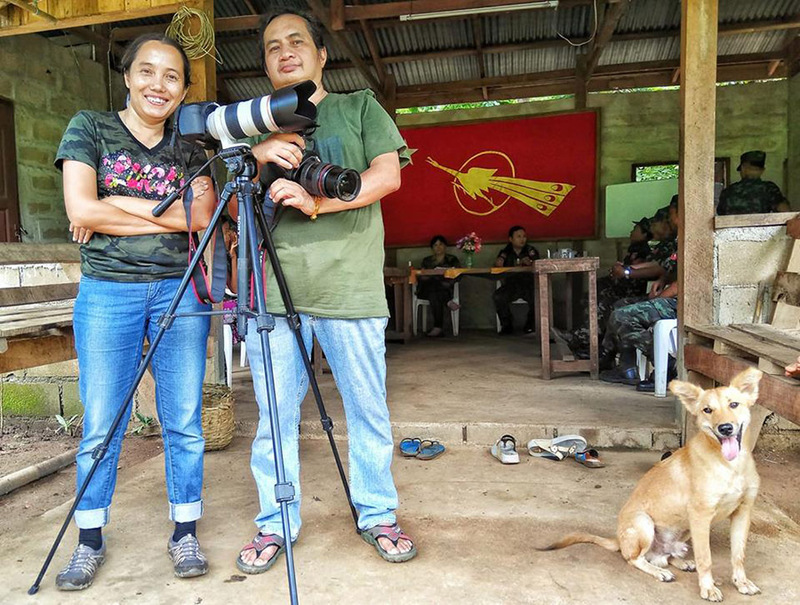 She has produced and directed dozens of documentaries covering civil war, education and political transformation in Myanmar.